The beginning of a new year see us rolling out some new years resolutions. This is mine…This year I made a resolution to write this blog and post helpful information for both my clients and colleagues in the industry. This being my first post of 2013, I thought it wise to start on a good footing – always helps! So, I’d like to share with you some helpful tips about advertising yourself on your Twitter page, using your Twitter background. I’m also giving away a free Photoshop template with all the information layered to help you optimise the setup of your twitter background. Free Advertising, courtesy of Twitter! Although we all have knowledge of the Twitter background settings, many of us still do not utilise them to our advantage. Twitter is about making connections with people or products that we find interesting or useful. What is the first thing you do after reading an intriguing tweet from a new source? If you’re interested in finding out more about them you’ll start looking for information that tells you more. This is where the ability to upload your own background image is so helpful. Twitter gives you some help with the ‘Profile Bio’ which gives you 160 characters to say everything you need to about your company, product or service. But one sentence isn’t enough to satiate our curiosity, so we start looking for other information. Your page background gives you the opportunity to make a visually appealing pitch to your potential followers and feed them more information that can and should include a prominent web address and telephone number. It also gives you a platform to brand your twitter account in a way that reflects your personality, be it personal or business oriented. There are a few things to understand about how Twitter implements your background image so you can get the best out of the space you have. 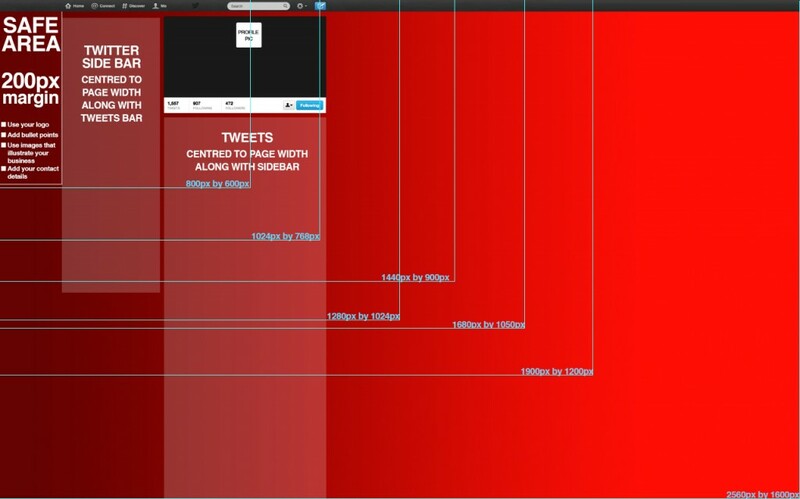 Twitter’s background is a static image. This means it’s fixed in one position and doesn’t move with the page as you scroll up and down. This has one advantage and one set back. The advantage is your information will always be visible, even when the viewer is scrolling down through your tweets. The disadvantage is you only have a certain amount of room in which to display all relevant information. Too much in a vertical direction will result in your information being cut off. Also, because the main section for tweets and the side panel are centred horizontally on the page this makes it hard to to gauge how much width to give your information. So below are a list of pointers that will help you create an image which makes the most of the room you have. Twitter allows for tiled images where the image repeats itself across the background. However, this doesn’t lend itself well to displaying important information in an appealing way.It’s therefore best to create one image to cover the whole background. This image should be 1600px deep. Don’t be tempted to go larger, the majority of users will not have screens above this size. Use a width up to 2560px. Again, this is because of popular screen sizes. Any bigger and the image may exceed Twitters file size rule and therefore be discarded. If you are not using a full background image, just create an image 200px wide. You can set the Twitter background colour to match the background of your image, giving a seamless background – I’ve used this technique with the Synapse twitter page. 200px wide is the amount of safe space in which you should put your important information. Any wider than this and you risk losing it behind the Twitter page elements. I’ve included a safe area within the template file. If you keep your information within the boundaries your results should be fine. Some people like to use full screen background images. This can look great if it’s either an abstract, close-up image or easily recognisable. Also patterns can work really well and create a welcome depth to the page. However, be aware that the majority of your background image will not be viewable as it will only sit behind the Twitter page elements. Don’t be tempted to use Twitter’s pre made theme images. These are very basic, they don’t allow you to put your own information over the top and it would be hard to find something that reflects your brand or personality. Place a nice big image of your logo at the top of the safe area (see template). Twitter doesn’t provide a large area for this any where else. There is the Twitter header but there are good reasons not to use this section for logos as explained further down. Place a brief sentence about you or your company in a headline style. It’s not essential to go into detail at this point as you don’t have the room at that size and you also have a bio and bullet points. Place your contact details in a prominent place. Don’t be tempted to put them at the bottom. They may go unseen especially if the viewer has resized their browser. Your contact info should really be at eye height, the top third of the screen should be fine. Place bullet points or a description of what you do below your contact details. This is a good way to get across everything you couldn’t say in your 160 character Bio. The twitter header image was introduced in 2012. It allows you to upload an image up to the size of 1252px x 626px. This is approx. twice as big as it will actually be displayed. Bare in mind that your company logo image, your twitter username and tag and your Bio text will be placed over the top of this image, so again think about what kind of image you upload. Areas in the centre of the image will be lost. That’s it! You should now have a twitter page that reflects your company brand or personality and that gives relevant information in a concise, visually pleasing and easily readable manner. 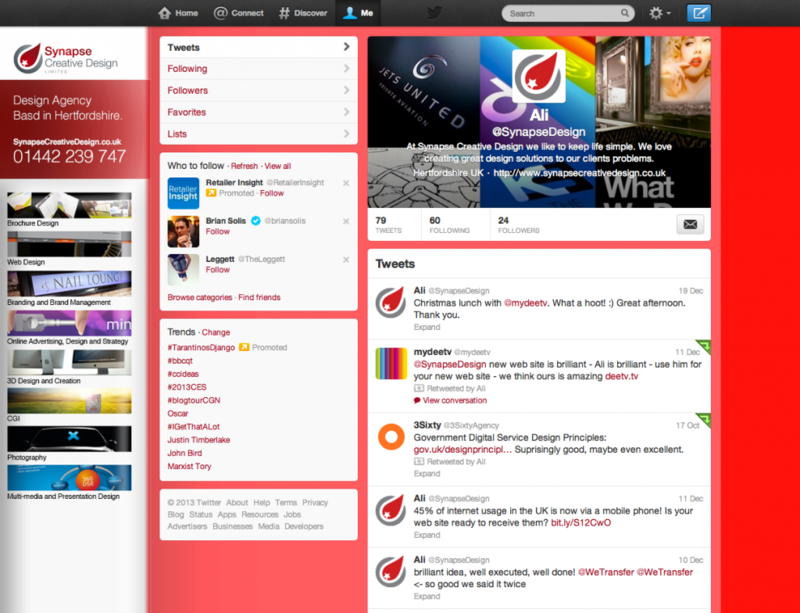 Please click the following link to Free 2013 Twitter Background Template PSD. Feel free to use it and pass it on to others. If you don’t have photoshop, simply open the template-screenshot.jpg in Powerpoint or another visual program and create your image over the top. I haven’t room here to write about putting the image live on your twitter page but here’s a great article that tells you exactly what to do and how. this is exactly what i looking for about 2 weeks! this is the first comment, but sure its helped a lot of people! keep the work!